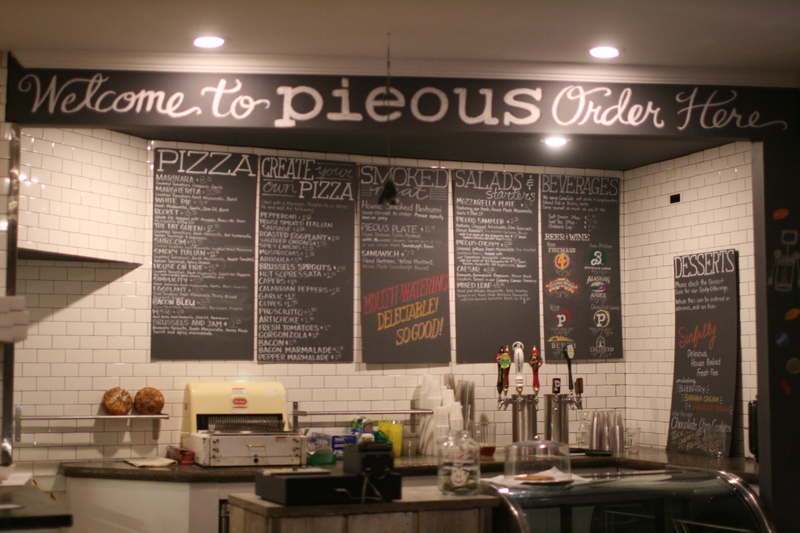 Nestled in the no man's land off Highway 290, Pieous is one of Austin’s newest culinary gems, serving up fresh pizza, salad and pies. Located close to the Nutty Brown Cafe, it's about 45 minutes from campus, but we thought the fresh mozzarella and creative atmosphere was definitely worth the gas. Not only does Pieous serve up artisan-style pizza, but it encourages it’s customers to be artists as well. Parts of the walls are coated with black paint, and sticks of chalk lie around for customers to use as they please. All of the art on the wall is done in chalk, and it’s impressive at that. At the center of the eatery is a large brick oven where various pizza pies are crafted and prepared. It was a very open area that allowed customers to be a part of the pizza-making process, in a sense. We dined in around 7 p.m. and most of the tables were full of families, friends catching up or couples on a date. We sat at a long, wooden table. It was a small, intimate space that almost made you feel like dining at a friend’s house - a friend who lets their children color on the walls, that is. We ordered a Margherita Pizza (a classic Italian-style pizza) that, according to Italian legend was named after Queen Margherita of Savoy. Pieous’ version had all the usual suspects: rosy red tomato slices, house-made mozzarella, with sweet and herbal whole basil leaves delicately placed in the middle of the pie. 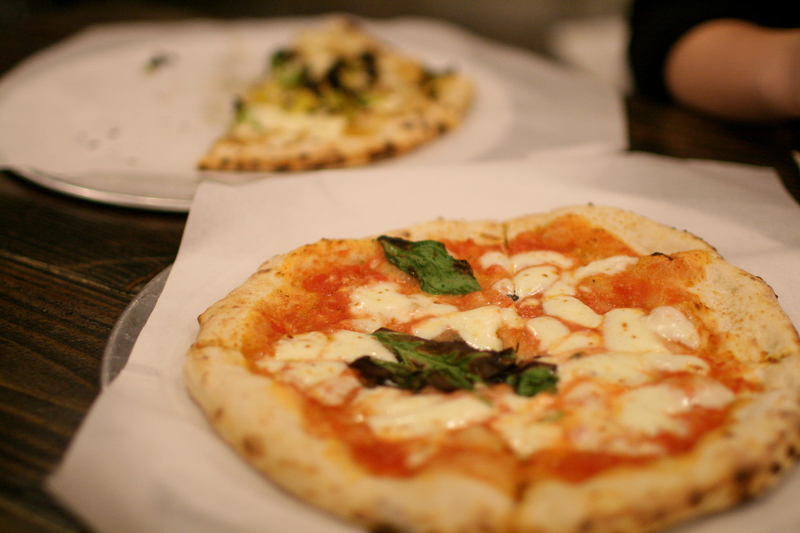 The pizza was gorgeous, but we wished there was just a little more basil to spread around. Their crust, the most important part of a pizza, in our opinion, was a chewy sourdough rolled out extra thin with a little wood-fired char on the bottom. It was spot on and so fresh that Sara was reeling in nostalgia from her study abroad trip this past summer in Italy. 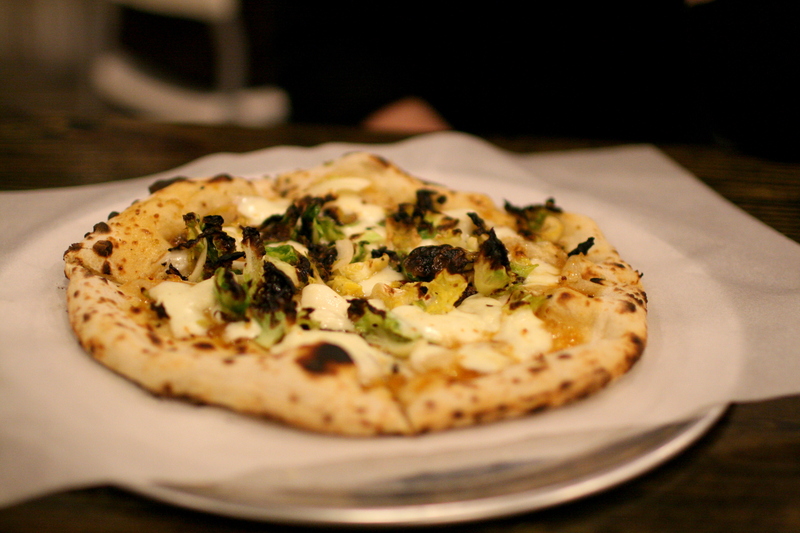 Next, we chose their Brussels Sprouts and Jam Pizza, because, why not? It was another thin sourdough pizza with marmalade, gobs of mozzarella and roasted Brussels sprouts. We really were fascinated by the culinary concept behind this pizza, because the sweetness of the marmalade would go fantastically with the charred greens and savory cheese, but it felt like it was missing something. Maybe a more jammy jam? Then we moved on to dessert. Pieous, being so pie-minded, serves not only pizza pies but dessert pies as well. 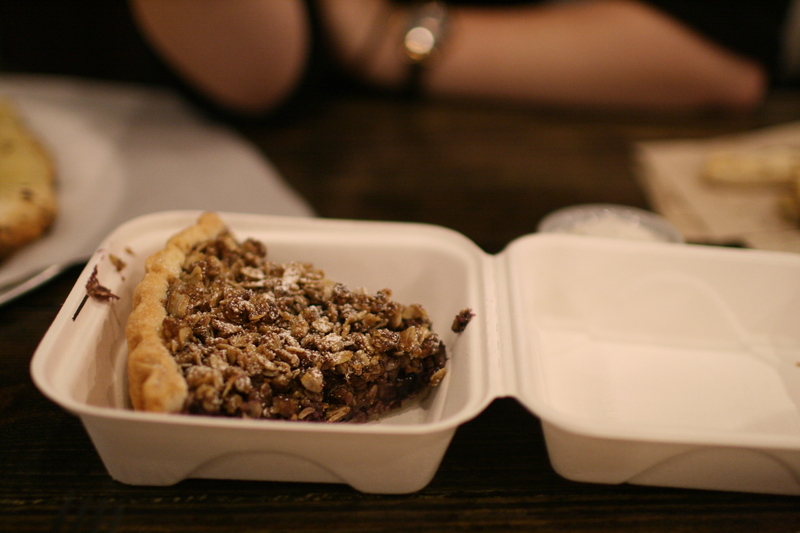 Of their three pies available, we opted for the blueberry pie, with was a granola and whole blueberry delight. The texture, crunchy granola and pie crust with the sweet blueberries and likely homemade whipped cream was the perfect ending to a night full of pies.